This is the same scientist who called Bush administration global-warming skeptics “court jesters” in 2007. 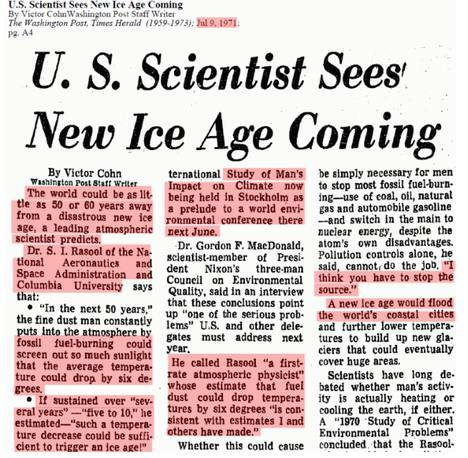 NASA scientist James E. Hansen, who has publicly criticized the Bush administration for dragging its feet on climate change and labeled skeptics of man-made global warming as distracting “court jesters,” appears in a 1971 Washington Post article that warns of an impending ice age within 50 years. The scientist was S.I.Rasool, a colleague of Mr. Hansen’s at the National Aeronautics and Space Administration. The article goes on to say that Mr. Rasool came to his chilling conclusions by resorting in part to a new computer program developed by Mr. Hansen that studied clouds above Venus.